Our check to the William Way Center makes us patrons of this summer’s groundbreaking exhibit at the National Constitution Center’s “Speaking Out for Equality: The Constitution, Gay Rights, and Supreme Court.” This coincides with the 50th anniversary celebrations of the first demonstrations in support of gay civil rights in the United States, in Philadelphia at Independence Hall in 1965. There will be a weekend full of events, commemorating the anniversary, this 4th of July weekend in Philadelphia. Our satellite store, Philly AIDS Thrift @ Giovanni’s Room, will be hosting Barbara Gittings day on Sunday, July 5th. 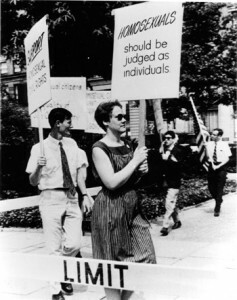 Barbara was one of those early marchers and a key figure in the struggle for LGBT freedom. The author of the first and soon-to-be-released, biography of Barbara Gittings will be at PAT@Giovanni’s Room, signing her new book that day!